Episode 24 Greek. 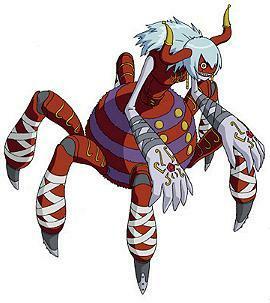 Archne is a misspelling of Arachne, the name of a girl who was turned into a spider in Greek mythology. Flymon + Win Ratio 40% This cruel and inhuman bug master likes to play with the prey she captures! Has the powers of "fighting" and "underground"
If you discard one Insect Digimon card from your hand, your attack increases by 200 against the opponent's Insect Digimon (max. 1 card).